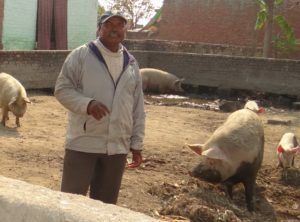 Mr. Aman Lakra, farmer from Abhaypur village, Bareilly district, Uttar Pradesh started his life as a farmer with dairy farming. His only asset was his family owned 1.5 acre farmland on which he used to grow some fodder and cereals for his personal use. As dairy unit operations were standardized he decided to add some more elements of agriculture in his farm thus he slowly ventured into horticulture, poultry, duck, goat, pig, fish and bee-keeping. “I took training in all sectors one after the other from Krishi Vigyan Kendra-IVRI Izatnagar. Dr B.P. Singh, Principal Scientist and Programme Coordinator had always extended the required help and support in all my endeavors,” he adds. Subsequently his income increased four times and now his farm is 22.02 acre. Mr. Lakra rears 55-60 indigenous birds including premium breed ‘Aseel’. “Demand for Aseel bird is high as it is the fighting bird. It is sold at premium price and very easy to sell. I earn about Rs. 45-50 thousand annually from Aseel bird. Besides every day on an average 25 eggs are produced that are sold at Rs. 5 to 7/egg. It is the additional profit. Birds are fed with grains produced in my farm,” he shares. There are two fish ponds in the farm, 3000 and 2500 square yard respectively. “I use these ponds for fish as well as duck. As mine is an integrated farm I have selected easy to manage fish breeds namely magur, rohu, catla and common carps. These are sold in retail at weekly market or customers to my farm,” he says. The annual fish production is 10-12 quintal magur and 8-10 quintal other fish. Fish fingerlings are purchased from local fish hatcheries such as one inch size catfish at Rs. 1 and 2.5 inch rohu/catla at Rs.250/kg. Along with the fish, he rears 75-80 ducks in the same ponds. Water in the pond is treated with lime and potassium permanganate as a preventive measure from all sorts of contamination. Two buckets of cow dung is also added in the pond every week as nutritional supplement. 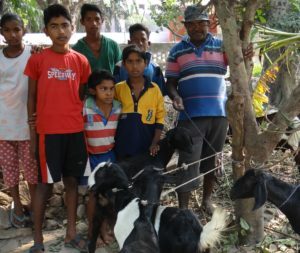 Black Bengal breed of goats are reared at the farm. The goats feed on green fodder and leaves of banana and other trees available on the farm. “By nature goats like to graze so around the bund of fish pond I have grown some shrubs and grass. It roams freely and grazes as required. This activity ensures good health of goat,” he states. Every year 3-4 goats are sold that fetches him Rs. 30 -40 thousand. He rears prolific breed white Yorkshire and earns good profit from this small unit. “Initially I had purchased the parent stock of this pig breed from IVRI. Annually I able to sell on an average 7 pigs @ Rs. 80 – 150 per kg body weight. The profit earned per pig varies from Rs. 12-26 thousand. I feel pig rearing is lucrative farming,” highlights Mr. Lakra. “I keep 7-8 boxes for bee-keeping. The honey bees reared are Italian species that produces about 20 kg honey per month. By God’s grace honey of my farm gained popularity in neighbouring area as I keep it absolutely pure and sometimes extract fresh honey in front of the customers. The demand of honey is quite a lot therefore now I cultivate mustard and sunflower crops in the farmland exclusively for bee-keeping,” he states. Honey is sold at Rs.25.-300/kg. Growing vegetables and fruits is inseparable to any integrated farm. “It is important to grow trees in the farm as green cover is mandatory for maintaining the bio-diversity in the farm. I opted primarily for fruit trees instead of forest trees because it is more sustainable for a farm like mine, although I have few trees of teak. Fruit trees are banana, papaya, date palm, pindara, sapota, pears, orange, lemon, mango, coconut, water apple, custard apple, fig, star fruit, jamun, guava and tapioca. Vegetables grown in the farm are pumpkin, spinach, drumstick, kundru (ivy gourd or coccinia) etc. 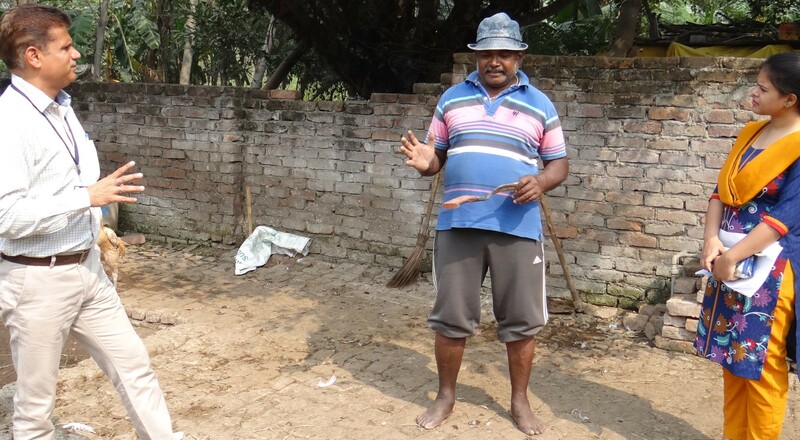 I grow only seasonal vegetables as it is easy to manage the farm if it is in alliance with the nature,” he shares. Spices, cereal (wheat, rice), oilseed (mustard) and legume fodder (barseem) are also cultivated. Entire farming practice is chemical free because the requirement of manure is fulfilled within the farm itself and bio-diversity keeps the pest away. Maintaining an integrated farm is certainly profitable but it demands proficient time management and is labour intensive. “I hire college students on part basis as they can learn and earn simultaneously and I have full-time laborers who live in the farm. Having resident labourers is beneficial as they can start the work on time and helpful at the time of emergency if any,” he insists. In future Mr. Lakra shall continue the present operations and diversify into mushroom production and agri-tourism. “I have kept the volume of all units within the manageable limits so that the farm runs on inter-dependence and is always interesting to work doing different activities. I find agriculture profitable as well as pleasing. It is extremely satisfying,” he concludes.